Heat oven to 375°F. Remove wrappers from chocolates. Chop 4 chocolates into small pieces; place in small microwave-safe bowl. Set aside. Unroll dough to form 8 triangles. Place 1 chocolate at center of wide end of each triangle. Starting at wide end, roll to opposite point; pinch edges to seal. Place rolls, pointed side down, on ungreased cookie sheet. Curve into crescent shape. Bake 10 minutes or until lightly browned; remove from cookie sheet to wire rack. Meanwhile, microwave reserved chopped chocolates at MEDIUM (50%) 30 seconds; stir. If necessary, microwave at MEDIUM an additional 10 seconds at a time, stirring after each heating, until chocolate is melted and smooth when stirred. 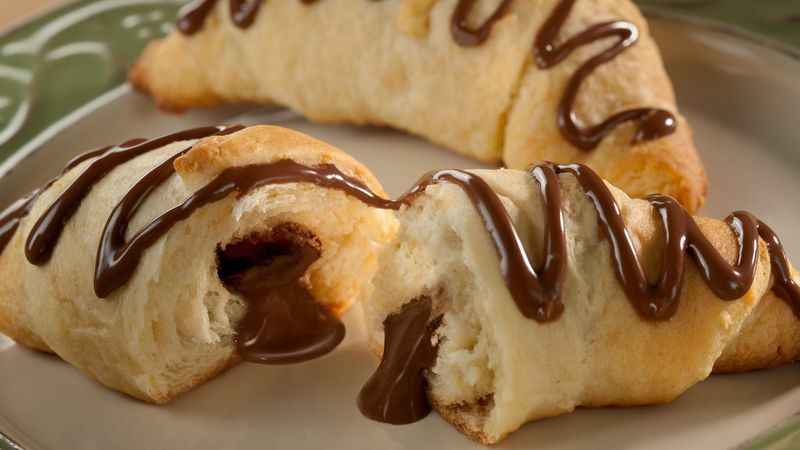 Drizzle melted chocolate over warm crescents; allow to cool slightly. Serve while still slightly warm. 8 crescents.